Mr. Katz (Adam Calcagno) walks away from Jackie (Stephanie Trypuc) in the spring play “Hot L Baltimore.” The play ran April 11-14 on the Vivian Fusillo Main Stage Theatre. 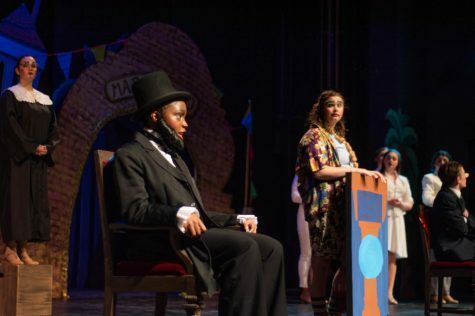 Winona State University’s theatre and dance department presented their final main stage production of the year, “Hot L Baltimore,” April 11-14. Jim Williams, a theatre professor at Winona State, directed the play. “Hot L Baltimore” was written by Lanford Wilson and published in 1973. 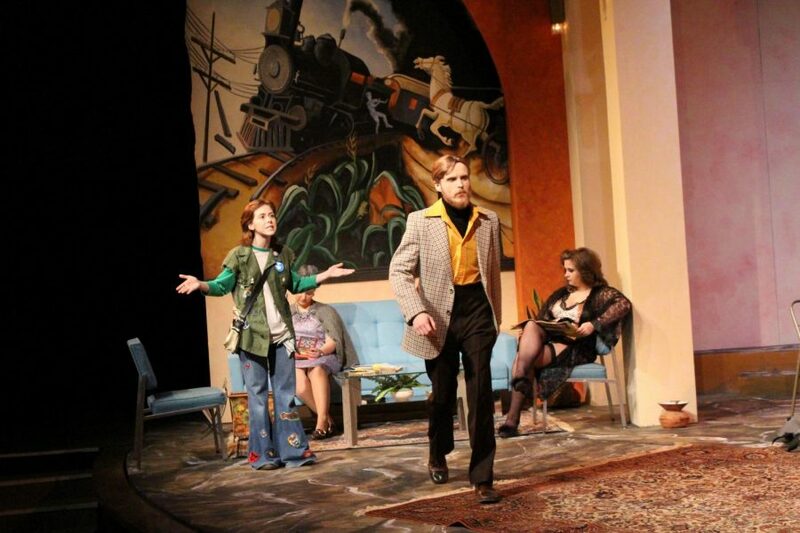 The play takes place in a run-down hotel in Baltimore, Maryland in the mid-1970s. The residents of Hotel Baltimore each have their own unique storyline that end up converging together with all the other characters by the end of the play. Each character begins the play struggling alone, unable to accept that they will all be evicted from their homes. By the end of the play all the characters end up coming together to help one another get through the day-to-day trials of life. The entirety of the play takes place in the lobby of Hotel Baltimore itself. Due to the lack of changing scenes, the play is made up purely of conversation and interaction between the characters. 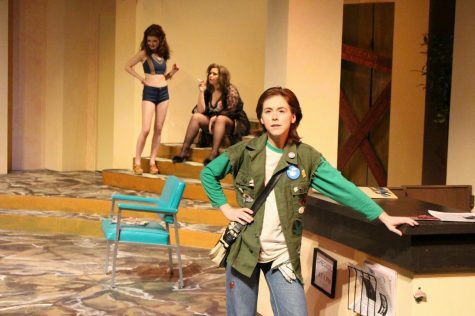 Jackie (played by Stephanie Trypuc) has a dramatic moment onstage while two characters(Right:Rochelle Hovde, Left: Ella Dierberger) mingle behind her. “Hot L Baltimore” took place from April 11-14 in the Performing Arts Center. This play explores the relationships between people from all walks of life, converging together to try and understand life itself and everything life throws at these characters. The play has a large cast of 14 members and over 20 people in the production staff. One of the many members of the play, Ella Dierberger, a senior theatre major, plays the role of “Girl”. Dierberger explained how difficult it was keeping the play upbeat when so many of the characters have such hard backgrounds. Many Winona State students attended and took part in the play. From first-year students attending their first play to seniors finishing their time in the theatre department, “Hot L Baltimore” brought Winona State’s student body together. Brooke Powell, a first-year communications major, attended the play opening night. This play is unique because the set never changes. The entirety of the play happens in the lobby, with any event outside of the lobby being unknown to the viewer. Having such a centralized set, it leaves a lot to the spectator to decide what happened to the characters outside of the lobby. The music in the play was another unique aspect because whenever music came on it was portrayed as if it was coming out of an old-school boombox on the set of the play. 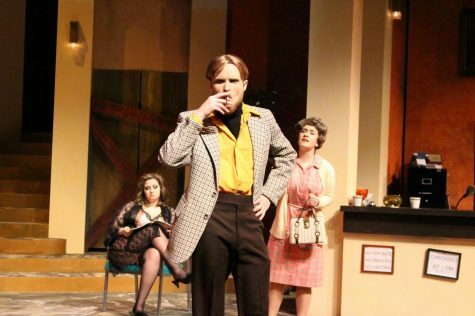 Mr. Katz (Adam Calcagno), center, smokes a cigarette while Mrs. Belloti (Hannah Angle), right, tries to talk to him. “Hot L Baltimore” took place from April 11-14 in the Performing Arts Center. Katrina Pfaffenbach, a first-year psychology and cell molecular biology major, also attended the play. Dierberger is very involved in the theatre department, she has taken part in every single production at Winona State since her first year. “Not only have I acted in many productions, I have also been props assistant, assistant stage manager, choreographer, costume designer, lighting designer, wardrobe supervisor, dresser, sound board operator, producer and master electrician. I also work down in the costume shop, where I help to sew the costumes for all productions.” Dierberger said. Another student very involved in the production is Stephanie Trypuc, a junior majoring in public relations and theatre arts. Trypuc played the role of Jackie in the production and was also in charge of production publicity. Like Dierberger, Trypuc has been involved in theatre department since her first year here at Winona State also. At least once a semester, Trypuc has either been an actor in the play, or has been a part of the behind the scenes crew. 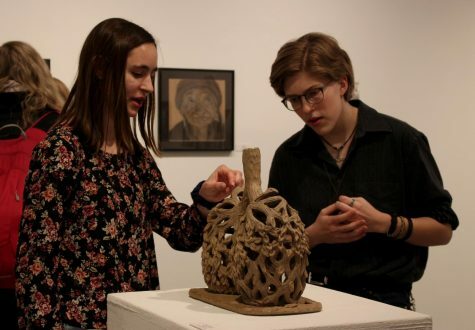 The students involved in the play keep Winona States theatre department alive and exciting, but more than that, they bring passion into the productions they perform. “Making art and sharing that and showing where all the time and hard work goes is the most enriching and empowering feelings in the world. I love the people I work with and that’s by far the best part.” Trypuc said. 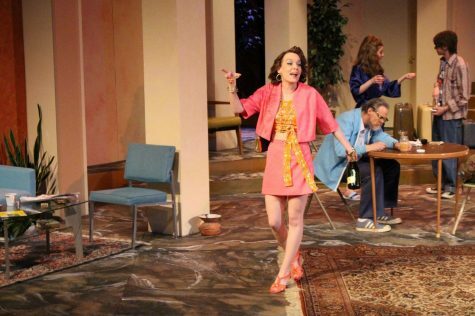 Suzy(Becca Borchardt) drinks champagne as she prepares to move from the hotel in Winona State’s production of “Hot L Baltimore.” The play took place April 11-14 in the Performing Arts Center. Another student very involved in the production is Stephanie Trypuc, a junior double majoring in public relations and theatre arts. Trypuc played the role of Jackie in the production and was also in charge of production publicity. Like Dierberger, Trypuc has also been involved in Winona State’s theatre department since her first year. At least once a semester, Trypuc has been either an actor in the play, or a part of the behind-the-scenes crew. 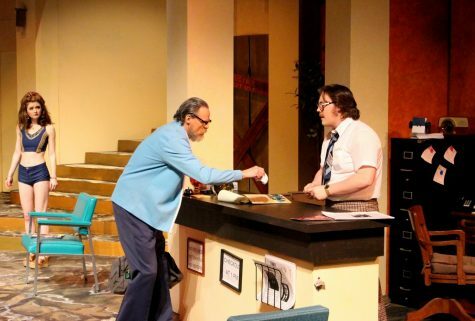 (Right to left) Mr. Morse (Carew Halleck) speaks to hotel desk clerk Bill Lewis (Cameron Lornston) in Winona State’s recent production of “Hot L Baltimore,” which ran from April 11-14 in the Performing Art Center’s Vivian Fusillo Theatre.